Bagara rice or bagara khana is a traditional Hyderabad's special rice dish. Bagara means tempering, so it is tempered with whole spices and no added masalas and vegetables. It can be made in a jiffy without much preparation. It is served with bagara baingan, dal and raita. Soak basmati rice for half an hour. Slit green chillies and chop onions into thin slices. This we do with the chips cutter. Make a onion into half and slice it with the chips cutter. Make fresh ginger garlic paste. Blend equal quantities of ginger and garlic in a blender jar and blend well. Heat oil and ghee in a thick bottomed vessel, add shahi jeera, cardamom, cinnamon, cloves and bay leaves. Once they start spluttering add onions and green chillies. Fry onions till they turn into brown color. Add ginger garlic paste, stir well. Add water to it. For one cup of rice add only 1 and 1/2 cup of water. Add salt. Bring it to boil. Once water starts rolling boiling, add soaked rice. Mix it well. Cover it and cook till the rice cooks completely. 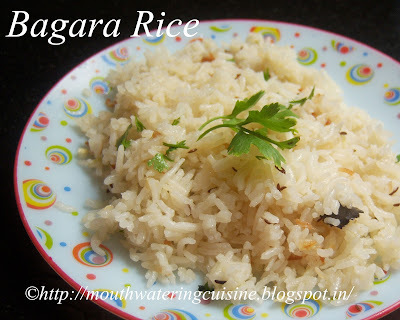 Once rice cooked completely, add ghee and mix it well. Simmer the flame and allow it to cook in a low flame for 10 to 15 minutes. Stirring occasionally. Once done completely, i.e. moisture evaporates completely, add lemon juice.